Historically, military leaders were heralded as heroic figures, with commanders including Wellington, Nelson and Kitchener venerated by the general public. Today, commanders are no longer celebrated. Stephen Cowell explores how British society's view of military conflicts has changed over the course of history, and asks challenging questions as to the future of armed conflict. Compared to historical wars, the number of deaths and casualties in recent conflicts is far fewer, and yet society is affected by these events to a far greater extent. The Iraq and Afghanistan invasions lasted longer than either of the two World Wars, and yet very few people would be able to name the military commanders in charge of these campaigns. Stephen explores why war is no longer viewed as glorious and heroic, but rather as sorrowful and reprehensible. Demise of the Military Hero charts the reasons as to why Britain engaged in conflict and examines society's attitude towards war through a series of vignettes of key past military leaders. 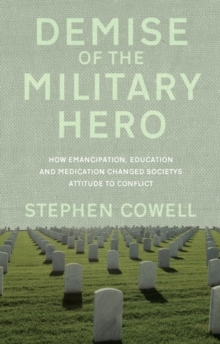 Stephen argues that the emancipation of women, supported by higher education for the masses and increased life expectancy caused the modern world to see warfare in a more negative light. Stephen's challenging and controversial book presents a wide-ranging analysis in an easy-to-read way. Inspired by the work of English historian, AJP Taylor, the book will appeal to those interested in British history and the military. Readers with an interest in women's issues and the changing role of women in society will also enjoy the book.